Spain has issued an international arrest warrant for ousted Catalan leader Carles Puigdemont. 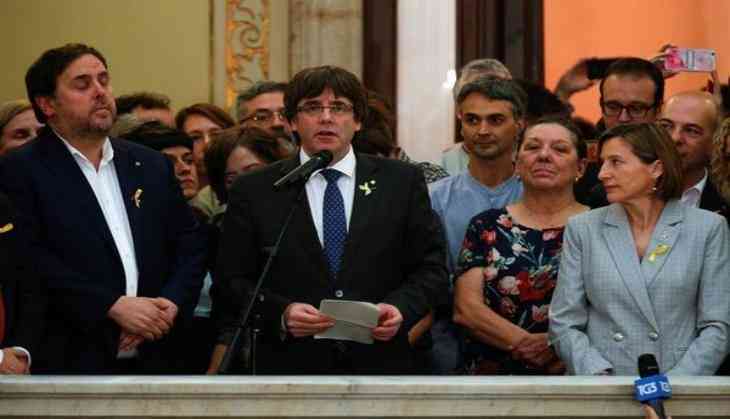 A Madrid High Court judge asked Belgium to arrest Puigdemont and four associates after they ignored a court order to return to Spain. Puigdemont, who, is currently in Belgium, said that he's not fleeing the Spanish court system, instead is seeking European support for his region's independence bid, reported CNN. The other four people, named in warrants, are Toni Comin, Clara Ponsati, Lluis Puig and Meritxell Serret. The charges include sedition, rebellion, misuse of funds, abuse of authority and contempt. Puigdemont and the 13 former ministers were ordered to appear before the Spanish high court. Of the nine former officials who showed up, eight were detained and one was freed on bond, the report further said. Puigdemont didn't appear, but issued a video message in which he called the court's action "an attack on democracy." According to the reports, the sacked Catalan leader is considering standing in a snap election in the region on December 21. Spain is embroiled in political crises after Puigdemont's administration held an independence referendum on October 1. Before Madrid's imposition of direct rule over it, Catalonia enjoyed wide autonomy, including control over its own policing, education and healthcare. The Catalan Government had said that it earned the right to split from Spain, claiming 90 percent of those who voted in referendum were in favour of independence. Catalan nationalists have always argued that the region is a separate nation with its own history, culture and language, and that it should have increased fiscal independence. Raees in Bigg Boss 10: Sunny Leone to accompany Shah Rukh Khan on Salman Khan's show!